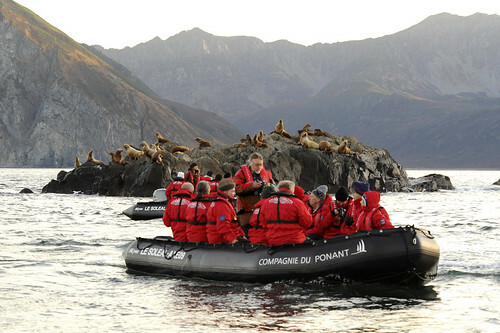 ECRUISING group of companies have begun a new partnership with French luxury expedition cruise line Compagnie du Ponant in 2015 and to celebrate are offering complimentary return economy airfares from Sydney, one-way flight from Juneau to Anchorage and one night complimentary pre and post cruise hotel accommodation when you book before March 31, 2015. Ecruising has designed an exclusive nine-night fly/stay/cruise package which includes a seven night cruise from Vancouver to Juneau in Alaska aboard the luxury mega-yacht, L’Austral. Offering elegant and intimate ambience with five star personalised service, the vessel is the ideal size for Alaska with just 132 cabins and able to moor in areas not accessible by the larger ships. Depart Australia on July 10 and have a night in Vancouver before boarding L’Austral. Sail through the Johnstone Strait in Canada before reaching your first port stop, Ketchikan in Alaska. From here you will visit some of the more off-the-beaten track locations in Alaska such as Misty Fjords, Kasaan, Sitka, Dunas Bay, Hoonah and Tracy Arm before reaching your final destination, Juneau. Another added bonus of this package is that there is no single supplement charge on the cruise portion, saving solo travellers up to 50 per cent. This exclusive package is priced from $5679 per person twin share and also includes all meals captain’s welcome cocktail and gala dinner, all house beverages and alcoholic drinks on board L’Austral, outings in Zodiac dinghies with experienced naturalist-guides, transfers and port charges and government taxes. Passengers from other capital cities can be accommodated with a supplement charged for return domestic flights to Sydney. Additional payment from Perth is from $566, Adelaide from $284, Melbourne from $278 and Brisbane from $260, these are subject to availability.